UNREST - Unsettling Remembering and Social Cohesion in Transnational Europe: A Meeting Place for all Nations? A Meeting Place for all Nations? In this post, Dr Marianna Deganutti, who is a postdoctoral research associate at the University of Bath working on the UNREST project, discusses her research on visitor responses to the Kobarid/Caporetto/Karfreit Museum in Slovenia. The Kobarid museum is located in a borderland at the crossroads of the three main European civilizations (the Germanic, the Slav and the Latin). Can the Kobarid Museum therefore be considered a meeting place for all nations? This is what we have been testing over the last few months through an in-depth examination of the museum books of comments over several years as well as on the basis of interviews to visitors. Situated just 8 kilometers from the Italian border, the Kobarid Museum displays the events that occurred during World War One on the Soška fronta / Isonzo Front between the Austro-Hungarian, German and Italian armies. 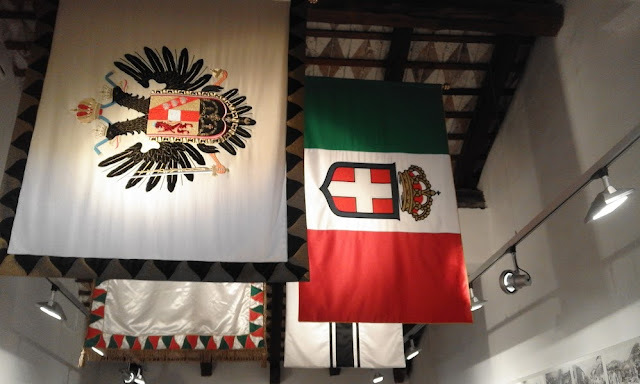 More specifically, the museum focuses on the Battle of Kobarid or the 12th Soča/Isonzo battle, that corresponded to a crushing Austro-Hungaro-German victory over the Italian forces. This battle is therefore commemorated as the ‘miracle of Karfreit’ by Austrians and as the ‘debacle of Caporetto’ by the Italians. As one can immediately imagine, the legacy of these events contributed to divided memories. The main exhibition conveys a strong anti-war message, through the display of the suffering of soldiers from all sides. This obviously reduces the potential clash between diverging viewpoints, but at the same time it may prevent critical reflection on some of the most controversial historical and political issues related to the twentieth century, that are still very much related to people’s lives. While there are elements in the museum which rare connected with these issues, they are not explained to the visitors or indeed problematized. For instance, as well as focusing on the First World War, the museum touches upon the fascist occupation of the Primorska region in the interwar period and during World War Two, when Slovenia was divided between Italy, Germany and Hungary, and when, in parallel, a civil war between collaborators and partisans was going on. The message of internationalism and peace conveyed by the exhibition related to World War One sits side by side with the message of a ‘just war’ fought by the Slovene partisans against fascist and Nazi occupiers and collaborationists. This apparent contradiction is not explored or reflected upon, nor is the memory rift that continues to divide Slovenia to this day over the nature and role of both partisans and collaborationists. For this reason, when we approached began to analyse the reception of this museum as part of the UNREST project, we aimed at investigating visitors’ reactions. In particular, we were interested in understanding: how do visitors’ react to the message of peace promoted by the museum? Do they interact with other perspectives? Do they engage with unsettling, controversial and still unresolved issues related to past conflicts? To test visitors’ reactions we decided to analyse the books of comments with a specific focus on comments written by Italian and Slovene visitors. The museum has collected all comment books since its opening in 1990. Due to the overwhelming number of comments throughout the years, it was not possible to examine and code them all. Therefore, we just selected some key years, including 1993, when the museum received the European prize, 1991, when Slovenia became independent and 2004, when it joined Europe and NATO. The analysis showed that a majority of visitors react positively to the message of peace. The museum can certainly be considered a meeting place between Central European countries (such as Austria, Slovenia, Hungary, Czech Republic, Slovakia etc.) and Western countries (in particular Italy, but there are many visitors also from the UK, Spain and France). Anti-war comments widely prevail in all these cases and are usually related to the fact that soldiers of both armies suffered and that war is a catastrophic event that needs to be prevented. This is also what emerged from the interviews to the visitors, who strongly condemned war. However, within this category there is a significant number of people who support the anti-war message, but remain sceptical about the possibility of learning from the past and not repeating the same mistakes in the future. Another important category of comments is present in the book of comments, though it did not emerge from the interviews. Many visitors seem to reject the message of the museum and support a patriotic or nationalist perspective. Some of them even strive for historical revenge. In their comments the linguistic register also changes, and words like honour, heroes, medals and glory (often written in capital letters) convey fairly bellicose sentiments and views. This patriotic group is obviously not interested in any possible encounter with the other, unlike the main group, which is moved primarily by strong feelings of compassion for all those who suffered and died in World War One, whichever side they fought on. In interviews, visitors seemed ready to recognize the existence and legitimacy of different perspectives. However, the lack of historical contextualisation in the museum was remarked upon by many visitors, whose feelings of compassion for the other did not seem to foster greater understanding of the other’s ‘difficult heritage’. We can conclude that the Kobarid Museum has potential as a meeting-place for all (European) nations. The dominant cosmopolitan message, the emotions that are stimulated by the main exhibition, the message of European peace and solidarity may foster a dialogue across national boundaries. However, the museum just hints at some difficult and unsettling historical events, that are not explained in depth. The visitor who is well disposed to meet the other would find it difficult to recognize, understand and come to terms with the conflictual past that has left a long-lasting legacy at both the international and domestic levels.